Finance is messy—whether it’s trying to keep track of how much you spend each month while also trying to save for short-term and long-term goals, it can all be overwhelming. But what if there was a way to organize or save your money based on its intended use? For example, if you could set aside a certain amount of money towards a trip around the world without having to worry about it getting spent. What if you could also stash away your rent money in another place, so you don’t even see it? And finally, what if you could easily give yourself a set amount of money to spend on things like going out, clothes, or entertainment? What if all this could be done in the same bank account so you could always have an overview of your complete balance without having to use a spreadsheet? We’d venture to say it’d be a lot easier to manage your finances. That’s why we’re incredibly proud to announce Spaces, the fastest and easiest way to save and organize your money. With Spaces, you can now open additional sub-accounts within the N26 app or web app. Each space is a sub-account where you can stash your money away for a special purpose or better organize your money to meet your needs. 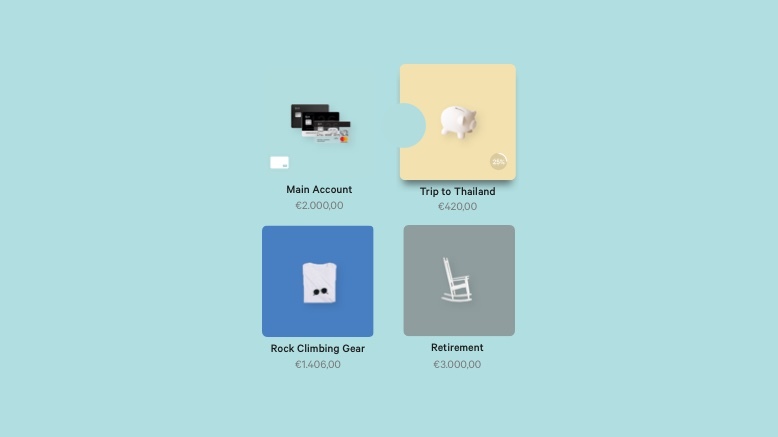 Spaces simplifies and better formalizes how we budget our money. For example, most people have a rough idea of how much they want to spend on things like groceries or entertainment and how much they’d like to save. So they have a system where they open both a checking/current account and a savings account and give themselves a set amount of money to spend each month. With Spaces you can do this all with one N26 login and in real-time. Just create a space, give it a name that describes its purpose and move money over from your Main Account. All of your spaces sit in one simple overview screen, where you can deposit money from your Main Account. That makes keeping track of multiple goals at the same time easier. Just give your space a descriptive name and image, and you’ll never forget what you’re saving for or how far along you are. Behavioral psychology proves that putting money out of sight and mind helps you spend less of it. Think of a cookie jar. If you keep it out on the counter within reach, you’ll be tempted to eat one each time you pass. Put it up on the tallest shelf and close the cabinet and you won’t. Your spaces are separate from your available balance, which means you can’t spend money that’s stashed away unless you move it back to your Main Account. In fact, you won’t even see it unless you open your Spaces overview. Out of sight, out of mind. We’ve also made it simpler to feel like you’re progressing towards your goals too. Each space lets you set a savings goal and see how close you are to reaching it. That’s great motivation to save more, which will get you to your goals faster. While it’s great to stash away money to save, sometimes you need to dip into a rainy day fund, which is why we kept Spaces as flexible and as easy to use as possible. Changes in Spaces occur in real-time; and you can open, close, and move money as frequently as you want. It’s unlimited. Moving money also couldn’t be easier: just drag and drop the amount from your Main Account to another space. Spaces is simply the natural extension of our commitment to building products that put your needs first. Our objective here is straightforward but ambitious: to create the most user-centric and adaptable financial product possible. That’s one of the reasons why we also made Spaces native to not just the N26 app, but our web app as well. Over time we plan on rolling out some features that will automatically help you save money in your spaces. We’ll announce some more details on here in the coming weeks. But as a sneak preview, they will include features like recurring transfers, savings rules, and sharing spaces. We really hope you enjoy Spaces. Let us know what you think on social media. And as always, you can email us any ideas you might have for improvement at ideas@n26.com. We do read these; in fact, many of the ideas we put into Spaces came directly from emails we received from you. Happy money organizing.